Door Intercom systems give great peace of mind as they allow you to see and speak to whoever is at your door without having to answer your door. We at Safenet Systems install a wide range of Door Intercom Systems for houses, apartments and commercial premises. We install voice only, video & voice and door release mechanisms. We also have an in-house locksmith for the complete security package. From single channel door intercom systems to digital multipoint refuge exchange systems, Safenet Systems supplies and installs any size of Intercom System, in an efficient and cost effective manner, ensuring that all current European Standards are adhered to. 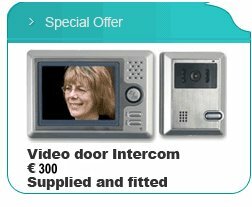 iVision+ Door Intercom System gives you the ability to view and talk to somebody outside your (front) door from the safety and comfort of any location inside your home or business. The iVision+ wireless intercom package includes a convenient wireless handheld unit with LCD monitor and a wireless doorbell/camera unit with up to 100m transmission range. The iVision+ package can be expanded to a complete system, allowing for multiple handheld units, multiple doorbell/camera units, and the ability to remotely release electronic door locks through a gateway/chime unit. 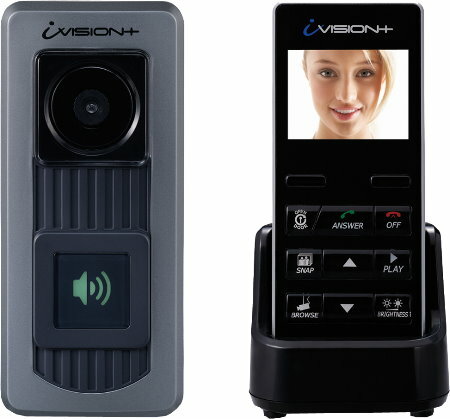 iVision+ is a scalable wireless intercom system that protects access to your home or office. Efficient, helpful, professional and knowledgeable. I made the switch to Safent and saved money. Colour door video intercom with two-way voice which automatically takes a picture. It also time and date stamps it, for each caller to your door. These images can simply be reviewed on your intercom.